Recorded/performed at: Iwaki Auditorium, ABC Southbank, Melbourne Stuart Greenbaum Marianne Rothschild, Glenn Riddle 18 mins, 23 sec. Recorded/performed at: Iwaki Auditorium, ABC Southbank, Melbourne Linda Kouvaras Marianne Rothschild, Glenn Riddle 28 mins, 41 sec. Recorded/performed at: Iwaki Auditorium, ABC Southbank, Melbourne Linda Kouvaras Marianne Rothschild, Glenn Riddle 5 mins, 41 sec. 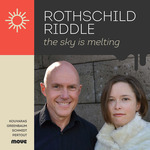 Recorded/performed at: Iwaki Auditorium, ABC Southbank, Melbourne Andrián Pertout Marianne Rothschild, Glenn Riddle 7 mins, 23 sec. Also includes: Argentinian Etching / William James Schmidt. Marianne Rothschild and Glenn Riddle formed as a duo in 2004, recording Stuart Greenbaum's Sonata for Violin and Piano for the CD Mercurial. Broadcast on ABC classic FM, ABC Radio National, 3MBS FM and Radio New Zealand, they have also premiered and recorded many works by Melbourne composers including Broadstock, Greenbaum, Pertout, Schmidt and Kouvaras. In recent years, they have appeared in concert at The Edge (Federation Square), Montsalvat, ACU, Melba Hall, Wyselaskie Auditorium, Waikato University (NZ) and Auckland. Notably, they present major works, such as the Franck Sonata, alongside new work. Tradition interwoven with innovation. This disc features music written for them by Melbourne composers. Music that is soulful, intriguing and rewarding. A snapshot of Australian musical voices at the turn of the millennium, brought to life in vivid performances (beautifully captured at the ABC) that reflect the times we live in. Includes programme notes and biographical notes on the performers. Score & Part: The sky is melting : for violin and piano / Linda Kouvaras. Parts: Sonus dulcis : for piano trio / Andrián Pertout.